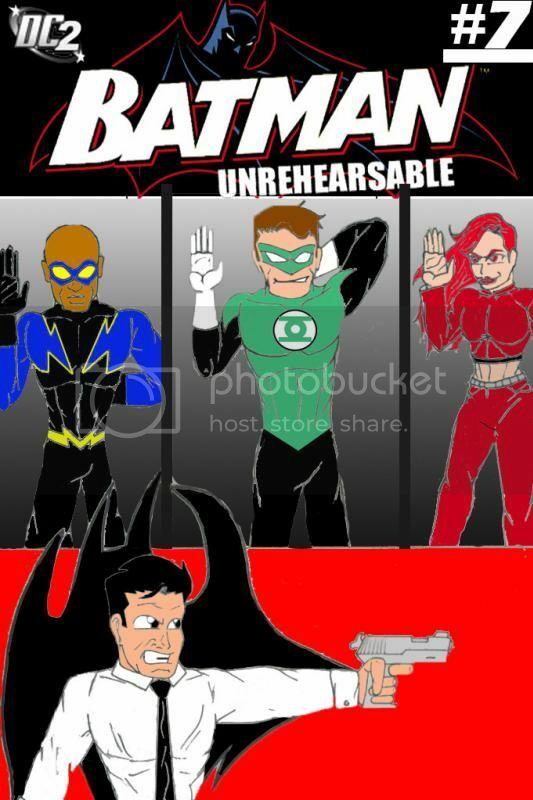 Unrehearsable #7 | DC2: New Adventures of DC's Heroes! He’d been a young officer working in the Property Crimes Unit when Batman had first appeared on the scene. While he’d never met the vigilante face to face, he hadn’t missed the sharp upswing in the number of injuries inflicted on suspected perpetrators. At first, he’d assumed that some of the more volatile among his police brethren—and Gotham had had more than its fair share of those back in the day—had been a bit overeager to secure a confession and had concocted some shadowy “Batman” to cover themselves. That idea had lasted until the day Maury had found himself walking past Commissioner Loeb’s office, only to see a thin cloud of vapor rising from a crack under the closed door. By then, Maury had been struggling to breathe. Over his own wheezing, though, he’d heard the commissioner gasp, “Batman... Don’t!” Then he’d ducked out of the room and run for reinforcements—but, by the time they’d arrived, the gas had mostly dissipated and the Batman was gone. Over the next few months, Maury had stopped doubting the officers who spoke of the Batman. Clearly, the vigilante was violent, temperamental, and had no regard for authority. He attacked without hesitation, assaulted without remorse, and escaped without consequence. At least, that had been Maury’s impression when he’d left Gotham to join the FBI, shortly before Loeb had been forced to step down. In the years that followed, he’d all but forgotten about the Batman, until his return to Gotham. On the surface, little had changed. The Batman had been a wanted man when Maury had left Gotham. He’d been an Arkham inmate when Maury had returned. The story was no longer news by that time, but, little by little, Maury thought that he’d picked up the gist of it: over time, the Batman had become more reckless, less of a nuisance and more of a menace, and now, he was safely locked away. He’d heard that there was a new Batman now, but Maury hadn’t had any dealings with him. When Sawyer had yanked him away from Internal Affairs to handle Wayne’s vetting, Maury had been sure that April Fool’s Day had come early this year. Sawyer couldn’t have seriously been contemplating bringing a man like that on board. Then he’d met him. Almost immediately, all of his preconceptions had gone flying out the window. Bruce Wayne was intelligent, calm—at least until Maury had asked a few pointed questions, but even then, Wayne had held his temper far better than most of the candidates he’d vetted. Wayne had a phenomenal memory. He was methodical. He’d also been extremely forthcoming with most of his answers—even when some of them were clearly painful topics to discuss. Maury was also struck by the way the other Capes spoke of him. Even Hawkman—and it was evident to Maury that there was little love lost between those two—obviously respected him. That was another thing. When you only saw the costumed crowd from afar—on the news or in photographs—it was easy to look up to them. They were an inspiration; a glimpse of what most people only dreamed they could aspire to. In person, however, they were a mixed bag. He was amazed at how normal Superman had seemed. For all his powers and all his abilities, there hadn’t been a trace of ego. Black Canary had been the same. They seemed like normal people that you might run into waiting in line at an ATM or filling up with gas at a service station. Batgirl intrigued him. There had been more questions that he’d been planning to ask her—after all, she’d probably logged more hours working with Batman than most of the others. He’d had a hard time getting around the language barrier. Still, despite her stilted speech, he’d been able to get a fairly clear idea of her opinions. He worried a bit about what Wonder Woman had told him. If Wayne had issues with using deadly force—and sometimes officers did have to use deadly force—how well was he going to integrate into the department? Mind you, his friendship with Gordon was practically a department legend, notwithstanding the former commissioner’s use of guns. His expression soured as he thought about Hawkman. He reminded him too much of some of the officers he’d had to question in IA investigations. The Thanagarian was hiding something—Maury knew it. The only question was whether it was something relevant to Wayne’s assessment, or whether it was just something that he didn’t want to share with an outsider. Maury frowned. He’d thought that he’d have Wayne disqualified in a heartbeat—but after the initial interview and the first day of background checks, he was no longer so sure. There was one question that kept nagging at him, however. If everyone had such respect for him, then why had Batman left? He sighed. He had three more interviews tonight and ten tomorrow. Hopefully, he’d get to the bottom of it. One way or another. Bruce shook his head. “Who knows? More questions, I suppose—although I’m not certain what else there is that they have to ask. I’ll find out Sunday, I guess.” Almost imperceptibly, Bruce shifted position and moved slightly closer to her. “The other interviews started this morning,” Bruce said. “Well, it’ll help to avoid those uncomfortable questions about how we met.” She sighed. “Bruce, most of your ‘old friends’ seem to be in the same line of work.” She shook her head. “At least the ones who don’t turn out to be with the competition,” she muttered. MC: How long have you known Bruce Wayne? BL: We first met about nine or ten years ago. I’d been going through a rough spot. For some reason, I’d lost my meta abilities. Bruce helped me figure out the problem. MC: And the friendship persisted? BL: I’m not entirely sure that ‘friendship’ is the right word. We work well together. We respect one another. But we never really ‘hang out,’ outside of business. MC: So you see eye-to-eye on a lot of things. BL: I’m trying. Okay. I’m presuming that if you decided to track me down, you probably put my name into your systems and if you didn’t know it before, you found out pretty quickly that I served as President Luthor’s Secretary of Education. MC: That’s a matter of record. BL: I accepted that position knowing that Luthor was corrupt, but believing that I could work better to bring him down from within. Batman wouldn’t have made that compromise. MC: But he has worked undercover. BL: He’s impersonated known associates of crime-lords, but while doing so, he hasn’t put himself in a position where he’s had to turn a blind eye to murder. In my experience, invariably, he’s broken cover rather than let that happen. Politics may not be as violent, but they can be just as bloody. I made choices I’m not proud of. I live with them. Not that this is about me. MC: You know, there’s something bothering me. Everyone I’ve spoken to today has incredible respect for him. Going by what you’re all saying, he should be leading the Justice League—maybe even be the public face of it. And yet, when you served under him, it was during a period when he’d quit the League, and that wasn’t the only time he’d done so. BL: Remember what I just said about politics? The Justice League is one of the best... deterrent forces this planet could ever have, and I’m not just saying that. Knowing they’re out there makes a lot of people feel safe and secure. It also makes a lot of people nervous. BL: Yeah, them too. I was thinking more of people in power. As in, I can’t help thinking that Luthor didn’t give me that post entirely because of my educational credentials. I have them, yes. But for a number of years before he ran for president, Luthor had a particular vendetta against Superman. And the reason for that was—to put it simply—because Luthor wasn’t as clean as the image he projected . Now, he knew that Superman knew the truth, but he also knew that Superman didn’t have evidence to support it, and that he would only go so far without it. Luthor was already a powerful man. Becoming president only increased that. And powerful men don’t like losing their power—and yes, that’s the voice of personal experience coming into play, there. The day Luthor took the Oath of Office, Superman graduated from being a thorn in his side to a threat to the free world—or at least to Luthor’s version of it. So he decided to fight fire with fire. BL: I don’t advertise my civilian identity, but I don’t take huge pains to hide it either. Luthor probably ran the same kind of background check on me that you’re running on Bruce. I have to say, I wouldn’t be shocked to hear that they had uncovered my... ah... extra-curricular activities at that time. MC: Getting back to Mr. Wayne’s issues with the Justice League? BL: Sorry. Okay. So, the League knows that, with the kind of talents they wield, they need to reassure folks that they aren’t out to wrest power away from heads of government—that they’ll obey the laws of the land. Basically, they’ll help with humanitarian aid and fight off interplanetary threats, but they won’t interfere in national politics. If they ever did, that could be seen as trying to seize power for themselves. MC: Or pushing an agenda. BL: You got it. So. When Baron Bedlam staged a coup and took over the throne of Markovia, the League felt that it couldn’t intervene. Batman, however, felt that he couldn’t stand aside. So he stepped down from the League and recruited a new team. MC: To go where the League wouldn’t. MC: How did the League react? BL: Just so you know, the League isn’t some homogenous monolith. And I’m afraid I don’t have an answer to your question, seeing as how I wasn’t with the League. However, whatever they might have thought of his actions at the time, they also recognized that he had a point. Once the Outsiders became more established, the League recognized that we could go in and do the dirty work that they couldn’t. MC: And they had no problem with that? L: They might have had one, had we been an assassination task force. Batman made the rules very clear at the outset: no killing. No sinking to the level of those whom we were fighting. MC: How did the Outsiders react to his rules? L: I wouldn’t say that. We questioned. Then we did what he told us. Usually he knew what he was doing. L: Actually, he did. Sometimes, things didn’t work out as he’d planned them, but they always made sense. MC: What happened when things went wrong? L: We got captured or we lost our quarry. MC: I meant, how did he react? L: He’d analyse. Look over what would have worked. If the error was on the team’s part, he drilled us, going over each error, explaining what went wrong. He demanded everything we had. We gave it. Then he demanded more. And we gave that, too. MC: And if the error was on his part? L: He drilled himself. He did that even if it was our fault, as if he was to blame for not training us adequately. L: I can’t speak for the early days. I wasn’t on the team then. But by the time I joined, I would only say that he was to blame in the sense that a commander is held accountable for the performance of the soldiers under him. Not his fault. But he saw it at his responsibility. MC: You’re sure of that. L: My abilities allow me to read other people’s thoughts, Detective. I wasn’t always as good at blocking them out. I’ve been inside his mind. I’m positive. MC: You’ve been inside his mind? L: Yes. Not recently, and I certainly wouldn’t do so now, without his permission, but yes, I have been. MC: Do you think that he’s capable of firing a gun? L: I think that it’s the second-to-last thing he’d want to do, but yes. He’s capable. L: Well, yes. The last thing he’d want to do is watch another innocent die. MC: [20 second pause] How does Mr. Wayne deal with failure? L: If it’s something he can correct, he doesn’t rest until he has. If it’s something he can’t, he doesn’t rest until he’s sure it won’t happen again. Frankly, he’s a lot quicker to excuse errors of judgment in others than he is in himself—and he’s not at all quick to excuse errors in anyone. MC: Is that why he left the Justice League to start his own team? GL: I don’t think so. I mean, Bruce isn’t exactly the most open person at the best of times, so I can’t say if he had other reasons. MC: Was that “can’t say” or “don’t know”? GL: At this point? You’re going back over a decade. I honestly don’t know. We weren’t happy when he stepped down, but time can give you a new perspective. MC: Are you nervous about something? GL: What? Oh. I... guess I’m not great when it comes to interviews. Never have been. MC: You know that this isn’t about you, right? GL: Sure, but I don’t want to ruin things for Bruce. MC: Do you think this position is a good fit for him? GL: I honestly think that he’s a good fit for anything he wants to be. MC: Now, when he came back to the Justice League, was there any friction? Did you still trust him to have your collective backs, even though he’d walked out before? GL: Look, nobody was under contract. We all had other jobs, other responsibilities. Most of us had our own cities to look after. So while we were all “League members,” the truth is that there could be long stretches when any one of us was unavailable. Batman actually did us a favor by being upfront in telling us he was out. MC: So his leaving had no bearing on your professional relationship. MC: Now, it’s fairly obvious that he’s done well, both as a team leader and as a lone fighter. How would you rank him as a team player? GL: I think... I’m not sure if I can explain this well. He’s a fantastic planner. He’ll come up with a plan and you know that if you follow it, there’s a very good chance that you, and everyone with you, are going to make it out alive. He... sometimes, on the news, you’ll hear phrases like “acceptable losses,” or “collateral damage,” when they’re talking about a military action. It probably means something like “500 people were facing certain death. We rescued 490. That’s fantastic.” Batman is all about “If ten people have to stay behind, you can ask for volunteers, but make sure that you’re one of those ten.” He doesn’t accept “acceptable losses”. And that’s why he prefers that you follow his plans, but you don’t follow him. Because he knows that he’s going to bring out all 500 people or die trying—but he doesn’t want it on his conscience that his teammates may have died trying to help him. MC: So he left because he didn’t want to endanger others, and then went directly into leading an untrained team into greater danger? MC: I’m not doubting you, but I am trying to understand. If he’s a loner who doesn’t like to lead, why would he found and lead a new team? GL: I’m guessing he had some plan. I mean, he wouldn’t do something like that unless he thought it was necessary. MC: To found a team, or to leave the League? Since, as you say, he could have just taken an extended absence, rather than formally resign. GL: Yeah, but if he had been a member in good standing when he led the Outsiders into Markovia, it wouldn’t have reflected well on the League. MC: Would you have kicked him out for that? MC: Okay. Now he resigned from the League not long before he was arrested in Gotham, too, right? GL: Not really. Things happened. He wanted to go it alone. GL: It was shortly after Sue Dibny’s death. I know that hit us all hard. MC: But you didn’t all resign. Was there anything... going on between Mr. Wayne and Mrs. Dibny? GL: What? You’ve got to be kidding me. No. No, of course not. MC: Sorry. I’m trying to understand what’s going on here. Murder is a terrible thing, yes. But only Mr. Wayne resigned. Why? Did he think that you were pursuing the wrong suspect? MC: Did he think that the investigation was being mishandled? GL: No. Actually, he was handling it. MC: Is it possible that he discovered evidence of some sort of cover up? GL: C-cover up? Like what? MC: I don’t know. That’s why I’m asking. Was someone attempting to conceal evidence? MC: Was Mr. Wayne keeping back evidence? MC: Was someone else sabotaging the investigation? GL: No. Well, kind of. I mean the killer was someone we knew and she was trying to deflect suspicion away from herself, but she wasn’t investigating. MC: So Wayne completed the investigation, caught the killer, and resigned. MC: How did he react when he discovered who the murderer was? GL: He was shocked. Horrified. We all were. MC: Do you think he stalled? Maybe because he didn’t want to believe the facts before him? GL: You really don’t know him very well, do you? GL: Bruce doesn’t shy away from the evidence—not even when it’s pointing where he doesn’t want it to. He’ll dig deeper if the pieces don’t fit, but once he sees the pattern, he doesn’t pretend it’s not there. MC: So he saw something familiar in the Dibny investigation. He remembered a similar case? MC: And he realized where the evidence was pointing. MC: What tipped him off? MC: What was the pattern he didn’t want to believe he was seeing? You said that the evidence was pointing in a direction he didn’t like. GL: Well... that the killer was someone we knew. MC: And someone was covering for them. GL: No. No, once and for all, that wasn’t the cover up! MC: Oh? Then what was the cover up? It was easier to fire the gun when he used rubber bullets—at least if, by “easier,” he meant that he could now pull the trigger and not feel his heart pound in his chest. When he checked the target, however, he found that of the fifteen shots that he had fired, fourteen had missed the target altogether, while the last had barely entered the outermost ring of the bulls-eye (he still couldn’t bring himself to use a silhouette-style target). He sighed. Hal gulped, feeling like he was back in the interview room. “Yeah, okay, sure. Tomorrow.” He hung up the phone. Instead of being over, it looked like his nightmare was just beginning. Bruce held out his hands as Helena bounded forward. He still wasn’t used to displays of affection, but they were starting to feel more natural—at least, where Helena was concerned. “Will you be coming upstairs any time soon?” Selina asked, trying not to giggle as Helena scrambled into Bruce’s lap, wrapped her arms about his neck, and deposited a loud kiss on his cheek. Bruce hugged her close. “Soon,” he said. “At least, that’s the plan.” He touched his lips briefly to Helena’s forehead and then released her. She looked around the cave with interest. “A good night’s sleep isn’t a bad idea,” Jim’s voice interrupted their conversation. Selina laughed. “I think he’s got you there, handsome.” Her eye fell on Helena and she nudged Bruce. Bruce’s scowl gave way to a smile. The little girl was walking carefully along a length of orange extension cord, her expression as serious as if she’d been on a tightrope. He started to get up, but stopped as he felt a hand against his chest. “I need a favor,” the voice on the other end said without preamble.